Papa Jack was born in Guadeloupe in 1921 to a very prominent family. His father owned the Ford Dealership of the West Indies and apparently also had some hand in an airline. He was educated in Europe and went to Sorbonne College in Paris for a period of time as well. Soccer was a huge part of his life, and he played on the French National Soccer Team as a young man before World War II. I played soccer my entire life, and he came to watch many of my games–always yelling on the sidelines that, “No one scores like they used to!” If you were to ask him if there was one thing that he knew he was great at (and trust me there were thousands of things he knew he was good at), it was that sport. 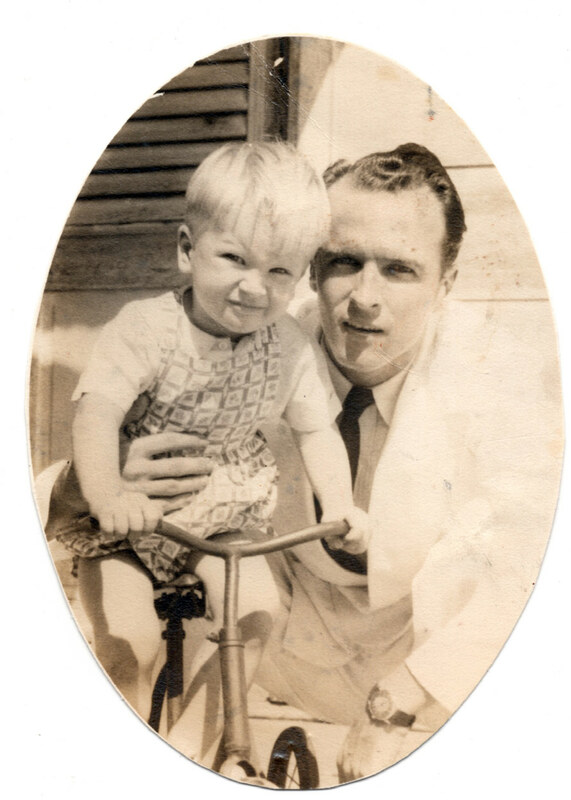 Jack with his son Ray in Pointe-a-Pitre in th elate 1940s. Courtesy of the Kinchen family. My Meme was born in 1925 to another prominent family on the island. Her father owned a large banana and coffee plantation on the island. Needless to say, they had money. As a girl she would walk to school each day, unless it was raining, and in that case her father’s chauffer would bring her. She loved the water and still speaks so fondly of her time soaking up the paradise that was home. The Ligniere name is still associated with bananas on Guadeloupe today. My great-grandparents got married in 1943 during World War II, and while they were still on the island they had their first two children, Ray in 1944 and Denyse in 1945. After WWII, there was a large amount of unrest on the island as the Guadeloupian community as they tried to move away from the colonial mentality that had created the nation. Through their search for a new “local heritage,” a sense of hostility towards representatives of French power began to build beneath the surface of their society. The main issue dealt with the citizens’ issues with French control as they were craving autonomy. Ensuring the protection of his family, my Papa Jack made the decision to move his family to America, where no one in the family had ever lived before. Only Papa Jack knew how to speak English. Once immigrated in America in 1952, they had two more children, Marilyn (my Mimi) in 1954, and Johnny in 1960. After a few moves around this new country, they finally found a piece of comfort and familiarity in French New Orleans.